The Common Murre is a large auk. The name “murre” comes from the Cornish word meaning Razorbill, which is a fitting description of this thin-billed bird. The bird was first described in 1763 by Erik Pontoppidan, an author, bishop, historian, and antiquary from Denmark. Photo Credit: Common Guillemot Uriae aalge – Langvía (Hringvía) by Ómar Runólfsson Uploaded by Snowmanradio via Creative Commons License. 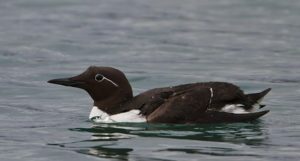 Like all auks, the Common Murre belongs to kingdom Animalia, Phylum Chordata (animals with a spinal chord), Class Aves (birds), Order Charadriiformes, and Family Alcidae. It further belongs to the Genus Uria and species aalge. Therefore, its scientific name is Uria aalge. 1. Uria aalge aalge, which is considered the predominate subspecies, or nominate bird. It lives in eastern Canada, Greenland, Iceland, the northern British Isles and southern Norway. In older books, it may be called Uria troille troille. 2. U. a. albionis, which is found in France, Germany, Spain, Portugal, and the Southern British Isles. 3. U. a. hyperborea, which is found in Northwest Russing, Northern Norway, and the Barents Sea. 7. U. a. californica, which is found on the Pacific coast of North America in California, Oregon, Washington, and British Columbia. Locally the Common Murre has other names. It is called the Common Guillemot, the Thin billed Murre, the Foolish Guillemot, the Guillem, the Gwilym, the Tinker, the Tinkershire, the Kiddaw, the Skiddaw, the Marrock, the Willock, the Scuttock, the Scout, the Strany, the Lavy, and the Frowl.